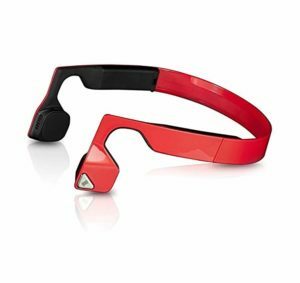 AfterShokz Trekz Titanium are the first sports bone conduction headphones made by AfterShokz. 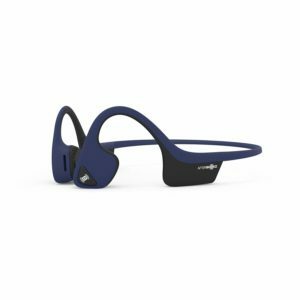 Compared to some previous AfterShokz bone conduction headphones, these are much sturdier and more comfortable. There is also an upgraded version of Trekz Titanium called Trekz Air, which is even lighter and more comfortable, but also significantly pricier. To be completely honest, we are not convinced that the number of improvements justifies such a high price of Trekz Air. In our opinion, Trekz Titanium is a smarter choice. 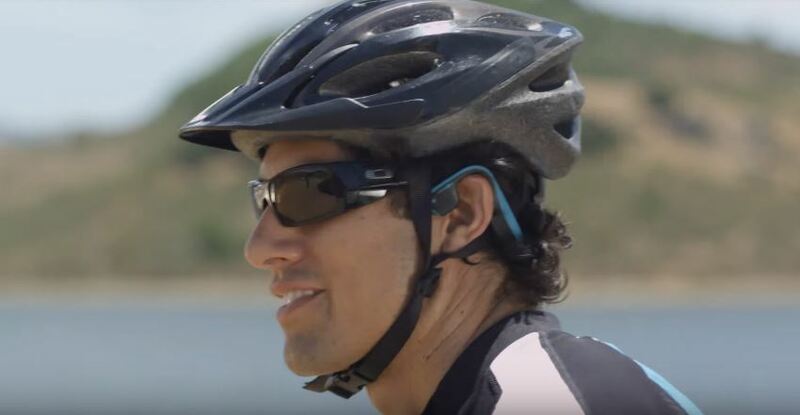 AfterShokz is the only recognizable brand when it comes to bone conduction headphones. If you do a little research on your own, you will see that all the other bone conduction headphones have some odd names that you have never heard of. In a way, AfterShokz is the only trustworthy manufacturer. In our honest opinion, AfterShokz Trekz Titanium headphones offer the best value for money (price/performance ratio) out of all bone conduction headphones on the market. They allow you to stay aware of your surroundings thanks to open-ear design, they are very light and very comfortable and provide great fit and stability. As the name implies, Trekz Titanium headphones are made of titanium and are incredibly durable. 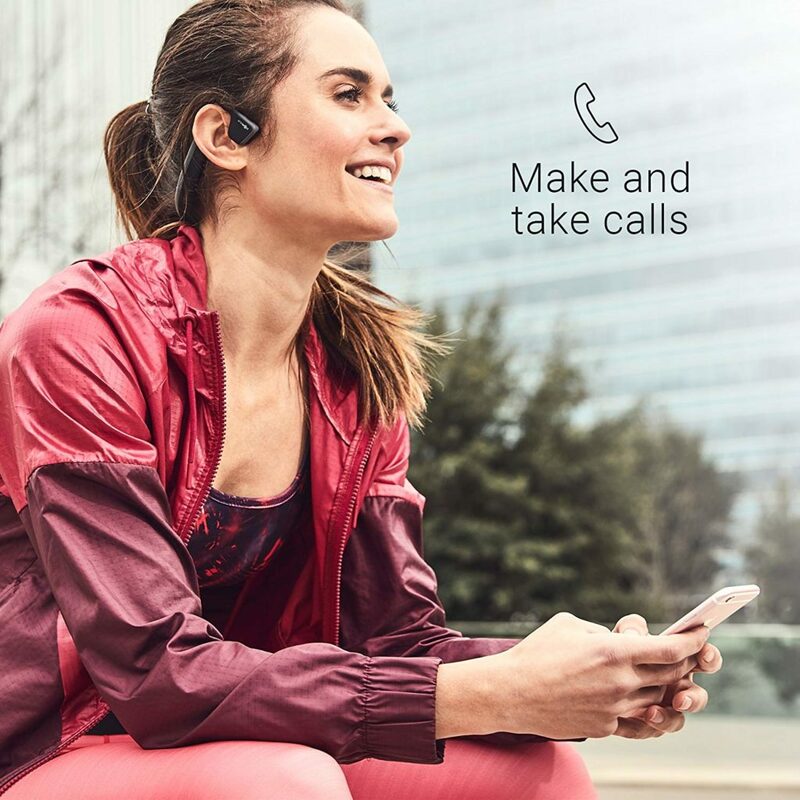 They are completely wireless (they feature Bluetooth 4.1 and have a built-in battery) which makes them perfect for sports activities (jogging, cycling, climbing, etc.). 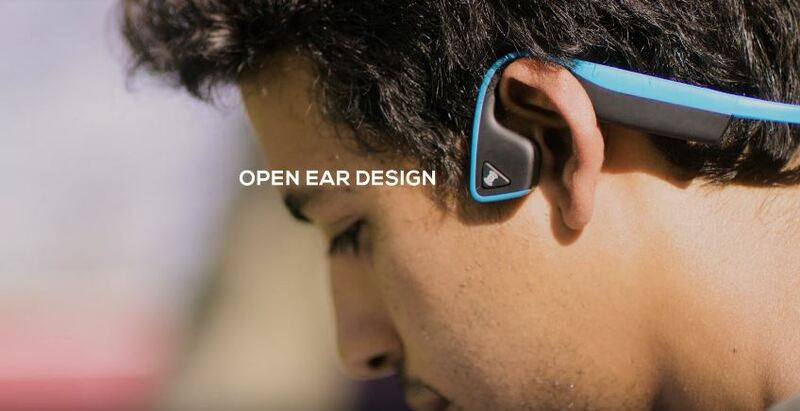 Most of the noticeable flaws (poor overall sound quality and poor noise isolation) are caused by the specific open-ear design and that’s something you can expect from any pair of bone conduction headphones. What we don’t like about this specific model is the battery life. They deliver 6 hours of playtime at 50% volume which doesn’t seem enough for the price. A bunch of regular wireless headphones (over-ear, on-ear, and in-ear headphones) within the same price range, or even cheaper, deliver significantly longer playtime. When it comes to bone conduction headphones, AfterShokz Trekz Titanium headphones offer the best possible price/quality ratio. 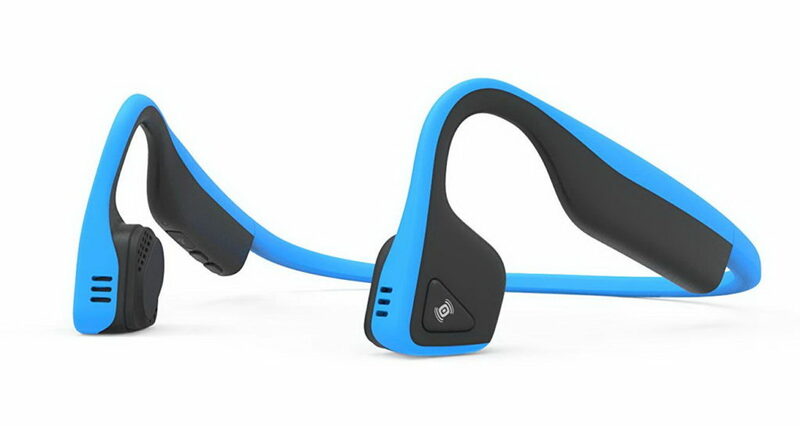 They have some flaws, but if you know anything about bone conduction headphones, you know that you will experience the same issues with all bone conduction headphones. What makes Trekz Titanium headphones better than others is the fact that they have more features and offer better performance for a reasonable amount of money. Trekz Air headphones offer slightly better performance but they are unreasonably pricier. AfterShokz Trekz Titanium headphones come in a simple box along with carrying pouch, foam earplugs, charging cable, and user manual. AfterShokz offer 2-year warranty for these headphones. Besides the regular packaging which can be yours for less than $90, there are some special bundles with additional equipment – Trekz Titanium bundle, tech, endurance, adventure, and golf bundle. The most significant difference between bone conduction headphones and regular headphones lies in their working principles. Different working principles cause all the other differences, and one of the most noticeable differences is the design. 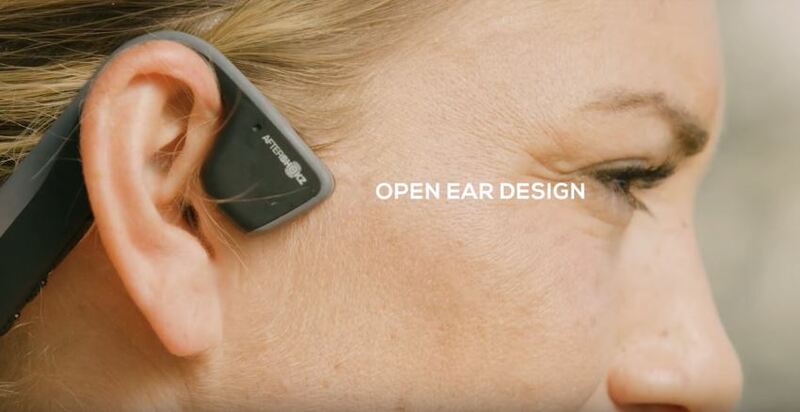 Bone conduction headphones don’t go on, over, or inside your ears. They are supposed to rest on your cheekbones, in front of your ears. That way, your ears are left open which allow you to be more alert and more aware of everything that’s going on around you. All bone conduction headphones have a similar shape and Trekz Titanium headphones are not an exception. What makes Trekz Titanium special is the selection of materials which makes them sturdier and more durable than others. Trekz Titanium headphones have sporty design. Two earpieces are connected with a thin neckband. There are five colors available – blue, grey, ivy green, red, and pink. On the left earpiece, there’s one multifunction button. You can use it to play/pause the music playback and answer/end/reject phone calls. On the right earpiece, there are two noise-canceling microphones. On the right neckband arm, behind the earpiece, there are two buttons (+ and – volume buttons), rubber flap protecting micro USB charging port, and a small LED Bluetooth/charging indicator. Volume + button is a multifunction button, too and it’s used to power on/off the headphones and to initiate pairing. There is one common feature for all bone conduction headphones and that’s the most advertised one. They don’t block your ears. They leave them open and allow you to hear everything around you. Better situational awareness is something you can get with any pair of bone conduction headphones. Still, there are some features that you won’t find on other bone conduction headphones. First of all, there’s the build quality. The neckband is made of titanium and then coated with silicone. The earpieces are made of hard plastic. The neckband is incredibly durable and can withstand all kinds of bending and twisting. The headphones are also IP55-certified, which means they are water and dust resistant. They can survive heavy sweating but you are not supposed to swim with them. Trekz Titanium headphones feature Bluetooth 4.1. The advertised range is 33ft. They also support multipoint pairing and you can pair 2 devices simultaneously with the headphones. NFC quick pairing is not supported. 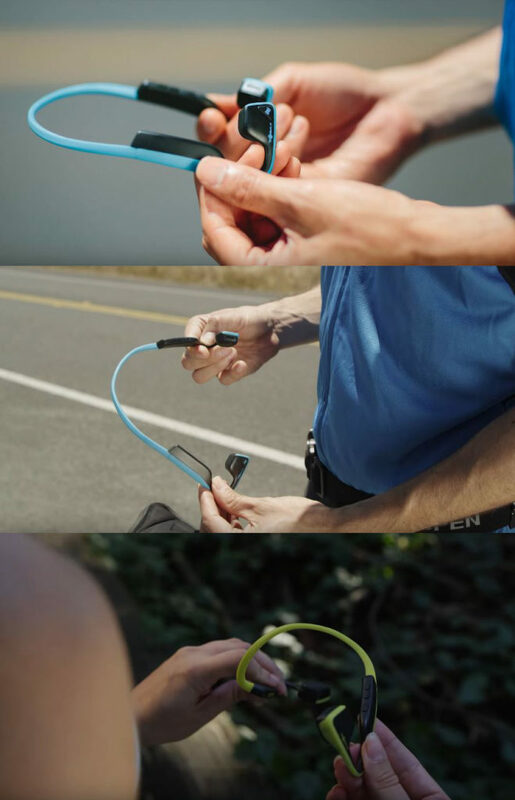 Trekz Titanium headphones have a built-in Li-ion battery. The advertised playtime is 6 hours at 50% volume and the recharge takes 1.5-2 hours. Like most of today’s headphones, Trekz Titanium headphones have a built-in mic. Two, actually. Both of them are located on the right earpiece. The performance is more than satisfying for the price. There are some glitches and minor issues, but the overall performance is great. The amount of comfort they offer is really amazing. They are light and don’t put too much pressure on your skull. They are kind of tighter than Trekz Air but they’re still very comfortable and, at the same time, they provide great fit and stability. Even if you want to wear them while cycling, with a helmet and sunglasses, you won’t feel any discomfort. Bluetooth connection works as advertised. Pairing is simple and quick and in order to initiate pairing, you have to hold the power/Volume + button for five seconds. You will be paired and ready to play some music in 10 seconds. The headphones also support multipoint pairing. Enabling multipoint pairing is a little bit tricky, but you just have to follow the instructions from the user manual or watch this YouTube tutorial. The battery is the only thing we don’t like about these headphones. It can deliver only 6 hours of playtime (at 50% volume). For. $90, we have expected a little bit more. AfterShokz tried to make them as light as possible and that’s probably the reason why the playtime is so short. You won’t get better playtime with any other pair of bone conduction headphones, but we are still not happy. The microphones work just fine when there is not too much noise around you, but if you are in a noisy environment or if there is too much wind, it becomes almost impossible to make/take calls. Trekz Titanium headphones don’t deliver the same sound quality as some regular headphones within the same price range, but they are still better than other bone conduction headphones. The biggest problem with all bone conduction headphones is the bass response. Their working principle is the main factor that prevents them from producing better bass and it’s practically impossible for bone conduction headphones to compete with regular headphones when it comes to bass. It’s simply too weak and it lacks serious impact. These headphones are more appropriate for listening to podcasts because of clear mids and highs. Vocals are perfectly clear and intelligible. The headphones can get pretty loud and one of the issues is sound leakage. It’s not huge but it’s noticeable at high volumes. Noise isolation is nonexistent since your ears are left open. That’s kind of the point of bone conduction headphones. 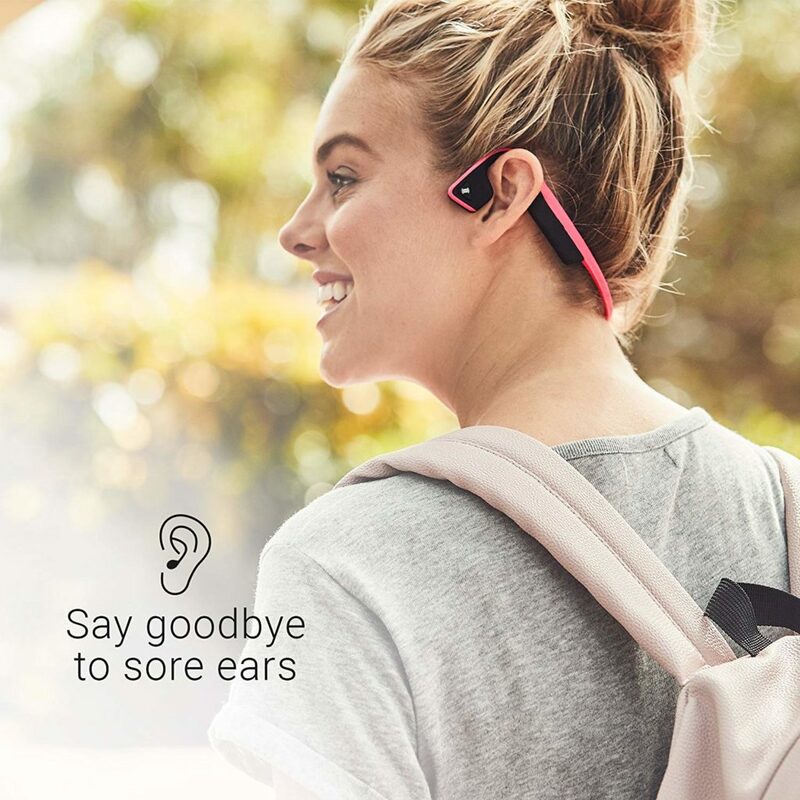 You can use the earplugs if you want to block the noise and you will definitely improve the sound quality that way, but the point of bone conduction headphones is to make you more aware of your surroundings and not to completely isolate you from the ambient noise. The number of competitors worth mentioning is actually quite small. We’ve picked three more headphone models for you. 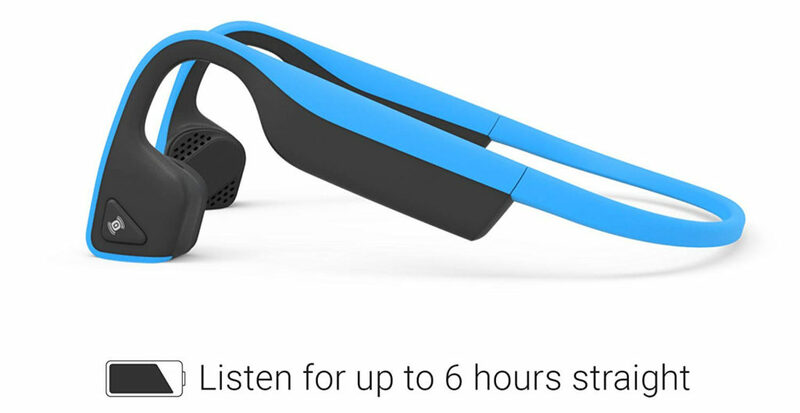 AfterShokz Bluez 2 is the very first wireless model made by AfterShokz. They are $20 cheaper than Trekz Titanium but we think that Trekz Titanium are still worth the price. Bluez 2 are shaped the same as Trekz Titanium but they are not even close to Trekz Titanium when it comes to build quality. Bluez 2 headphones are made of plastic while Trekz Titanium headphones are made of titanium and coated with silicone. Trekz Titanium headphones are also IP55-certified. The manufacturer claims that Bluez 2 headphones are water resistant but doesn’t offer any info on the IPX rating (which probably means they are not tested). On the other hand, the upgraded version of Bluez 2 called Bluez 2S features IP55 rating. Trekz Titanium headphones are also a better choice than Bluez 2 when it comes to comfort and fit. Trekz Titanium headphones feature Bluetooth 4.1 while Bluez 2 feature Bluetooth 3.0. They have the same Bluetooth range, but Trekz Titanium deliver better connection. Trekz Titanium headphones also support multipoint pairing while Bluez 2 headphones don’t. Both headphones deliver the same playtime and have built-in mics. Trekz Titanium deliver significantly better sound quality. Trekz Air is the upgraded version of Trekz Titanium. In many ways, they are very similar to Trekz Titanium, but they are significantly pricier. In our opinion, Trekz Air headphones offer slightly better performance, but not better enough to justify the price difference. In terms of design and build quality, these two models are practically the same. The number of control buttons and their placement is also the same. Trekz Air headphones are slightly lighter and maybe just a little bit more comfortable but Trekz Titanium headphones deliver slightly better/tighter fit. Trekz Air headphones feature newer Bluetooth version (4.2 compared to 4.1), but both models deliver the same range and support multipoint pairing. There are no noticeable improvements when it comes connection quality. Both headphones have built-in batteries and they both deliver 6-hour playtime at 50% volume. They also have the same built-in mics. When it comes to sound quality, the difference is not big. Trekz Titanium headphones maybe deliver slightly better bass (because of tighter fit) but Trekz Air headphones have slightly clearer mids and highs. Vidonn F1 Titanium is one of the rare viable cheaper options. Vidonn is a generic brand and you can find the same headphones under different generic names (like Borofone or Oannao). Vidonn F1 Titanium are $30 cheaper and if $90 is too much for you, you should try these. In terms of design and build quality, they are very similar to Trekz Titanium. They both feature IP55 water/dust resistant rating. Trekz Titanium headphones offer slightly better and tighter fit. They are both very comfortable. Both headphones feature Bluetooth 4.1 and have the same Bluetooth range, but Vidonn F1 Titanium doesn’t support multipoint pairing. Vidonn F1 headphones have a slightly stronger battery, but they both deliver the same playtime. Vidonn F1 headphones are noticeably louder than Trekz Titanium and deliver stronger bass, but Trekz Titanium deliver better/clearer mids and highs. AfterShokz Trekz Titanium headphones are maybe not the best available bone conduction headphones since there is also the upgraded version (Trekz Air), but they definitely offer the best value for money. 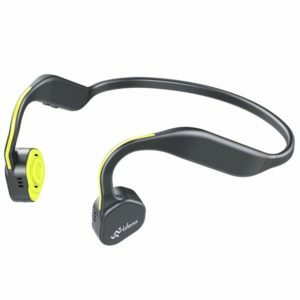 If you can’t spend $90 on a pair of bone conduction headphones, you can always experiment with generic brands like Vidonn or you can try wired AfterShokz headphones. 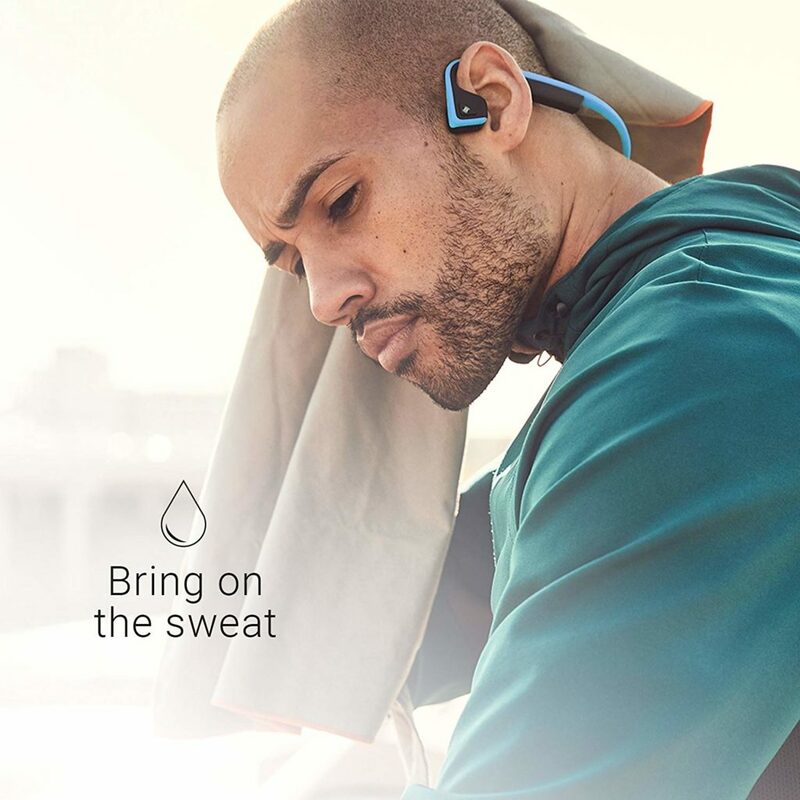 In the end, let’s not forget that bone conduction headphones are primarily designed for people with hearing impairment and people who can’t use sports earbuds/headphones because their ears are susceptible to infections. For those people, bone conduction headphones are the only way to enjoy music.